With 2018 coming to a close, we’re taking a look back at the municipal bond market and what we expect heading into 2019. Looking at the overall fixed income market, municipal bonds were one of the best performing sectors in fixed income. Performance for the municipal bond market is typically driven by just a handful of key inputs — namely supply and interest rates. With so much of 2018’s bond issuance pulled into the end of 2017 and the elimination of advanced refundings, the muni market expected supply to be somewhat muted. And muted it has been. We are into the year 11 months, and the full impact of the Tax Reform and Jobs Act has manifested in a supply decline for the tax-exempt market of almost -14% when compared to the same period for 2017. The biggest laggards in terms of issuance have been Texas and California, which have experienced a supply shortage of 15.2% and 27.3%, respectively. Even when adding in the additional $8 billion of projected issuance that is on the current Bloomberg forward calendar along with another estimated $15 billion, (the discount for a “typical” December), the muni market is expected to fall below the long-term average of $330 billion. While demand has been consistent, the supportive technicals have not had a chance to fully materialize due to an upward movement in bond yields. Two larger sustained periods of rate sell-offs (January and September), have put municipals on pace to have their first negative performing year since 2013. Fear not, muni investors! 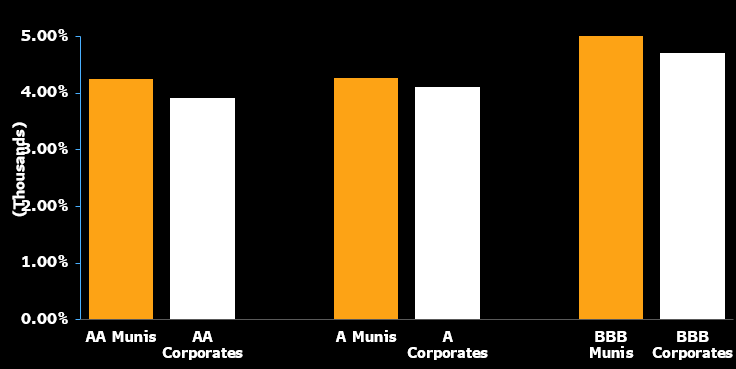 Despite year-to-date losses, it’s important to view muni performance on a relative basis compared to other fixed income alternatives. In fact, municipal bonds have been one of the best performing fixed income asset classes in 2018. The year-to-date returns for the Bloomberg Barclays Municipal Bond Index (-0.60) have beaten year-to-date returns for the Bloomberg Barclays US Aggregate Index (-1.95%), US Treasuries (-1.55), and U.S. Corporate Bonds (-3.71%). In addition, municipal bonds still carry one of the lowest historical default rates of any asset class. It’s also important to note that tax-exempt bonds still offer additional yield pickup over similarly rated corporate debt, which can help investors from a portfolio diversification aspect. 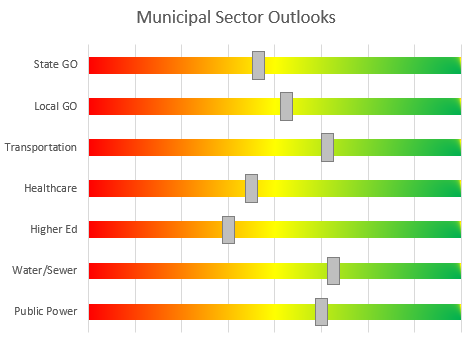 While our full 2019 municipal sector outlooks will be published under separate cover, we believe that municipal supply will continue to be restrained in 2019 and will run below the long-term averages. Any further sell-off in the rates markets should continue to have a negative impact on supply, as some municipal issuers may evaluate using cash for projects or even contemplate financing projects in smaller phases to help offset higher borrowing costs. We foresee the impacts of tax-reform to continue to be negatively felt through several sectors of the municipal market. Despite seemingly improving tax collections and lower unemployment, the U.S. economy is in the late stages of an expansion, and we are somewhat cautious on the state and local government sector going forward. With many general obligation issuers still adjusting to changes in the state and local tax deductions, we are assigning a lower weighting to general obligation bonds until a completion of a full tax collection cycle, absent of the early 2018 flurry of tax-prepayments. The longer-term impact of state and local tax deductions,combined with higher mortgage rates, has yet to play itself out in the sector in the form of softer housing prices and increased inventory. Lastly, the increasing trend toward subordination of the general obligation pledge from larger bond issuers, by selling securitized debt, is something to be aware of as fiscally constrained issuers look for ways to access the capital markets at more advantageous rates. We anticipate municipal bond performance to return to positive territory as we believe cash returning to the hands of investors in December and January will have them chasing a limited universe of bonds.